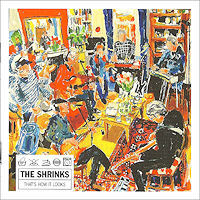 I see The Shrinks are set to appear at Bristol's Southbank Club on May 19th to launch their brand new CD, entitled That's How It Looks. Can't wait? No need to! A huge stock (at least 10 units!) of the shiny polycarbonate platter is already lining the shelf at Hillside Music, where the staff is on round-the-clock duty to ensure the anticipated demand will be met with the minimum of latency. Or something. This one is really worth a listen. Sparing no expense, the band gathered in David Brown's lavishly furnished luxury mews living room on the 4th and 5th February this year to record the album as if live. Gone are the overdubs -- instead the sparks of spontaneity are clearly audible. Or else that amp blew up again. Cop a lug-'ole full of anthemic Waiting For Love, or apocalyptic Wrap Party, or analyse Pete's co-write Talking. As if to celebrate the release, Hillside have slashed prices across the board -- you can now buy any of the stock items for just a fiver, plus postage (which they've regrettably had to increase by 50p to cover Royal Mail's overdue price adjustment -- I wouldn't like to be our postman, Tony, uncomplainingly crawling for miles over the mountainous southwestern suburbs of Sheffield with a whole sequence of sacks, every morning except Thursday and Sunday.) So, if there's anyone reading this who hasn't yet bought Winter Spring or Midnight Voices, assuage your shame right now! I love the left-field humour of Dave Brown's songs, from Dead man singing - the toe-tapping-tastic opener, as wonderfully life-affirming as only a song about death can be (y'know, like the McGarrigles' Work Song), and Good Times - an anthem for us all - right through to the final extended track, City Sidewalk Tree, a weirdly touching lament apparently sung by a lurching madman (sort of Pink Floydish imho). I must say I'm getting a little alarmed by my own increased tolerance for country music, though. Delighted to see a brief but highly enthusiastic review of That's How It Looks by Mr David Hepworth himself in the new edition of Word. Not available on-line, I don't think. Following our mention in dispatches in the penultimate edition of The Word magazine, the Shrinks have squeezed in under the bar (not that easy for a bunch of creaky old codgers) to feature on the cover CD of the very last edition.